New Inverness, Florida hotel offers premium amenities. Enjoy the comfort of our new Inverness-Lecanto Holiday Inn Express Hotel & Suites. 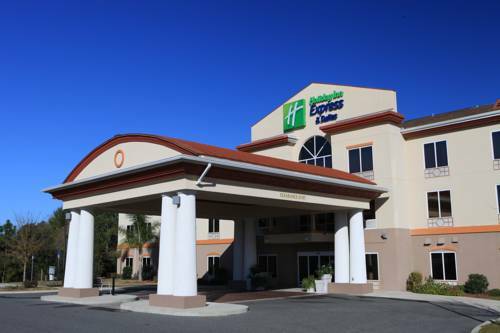 This Holiday Inn Express Hotel & Suites is located in beautiful Citrus County, a fantastic destination for both leisure and business travelers. Families will love staying at our Inverness hotel, located just off Highway 44. We offer convenient access to local attractions, including Homosassa Springs State Wildlife Park and world-class golf courses. Other activities include fishing charters and manatee tours on the Crystal River. With advance notice, our front desk can make discounted reservations for guided manatee tours. Business travelers can enjoy the convenient location of our hotel in Inverness, FL. Situated between Inverness and Crystal River, we offer close proximity to local businesses such as Wal-Mart, the Citrus Memorial Hospital, Citrus County Courthouse, Duke Energy Nuclear Power Plant and the future site of the Duke Energy Natural Gas Plant. In addition, we provide meeting space for 25 people with available audio/visual equipment and free high-speed, wireless Internet. Our business services include faxing, copying, printing and available computer use. While staying at our Inverness, Florida hotel, enjoy amenities including a heated outdoor pool, 24-hour Fitness Center and our free hot breakfast bar. Book your reservations now to take advantage of our great Lecanto hotel deals. Our guests get FREE Bloomin Onions appetizer at the Outback Steakhouse in Inverness when they show their Outback key cards. Casual dining serving American favorites. Brand new executive style meeting facility that has a capacity of 30 persons. Overhead projector and screen are available. Wireless internet access throughout the hotel. Complimentary coffee, tea and water with every booked meeting. Clothing, Florida Style Home Accents, Famous Brand Shoes etc. Grocery, Hair Salon, Nail Salon, McDonalds, and SunTrust bank all located within this store. Lcoated 1.5 miles east. This is a semi-private clubhouse for the Citrus Hills area. Huge Trashasaurus Rex, the stuff of Tampa children's nightmares, is made of garbage, and guards "the largest science center in the southeastern United States." Refurbished in 2011; the eyes light up at night.